Dos Ojos is a snorkel and dive site on the Caribbean coast, located just north of Tulum. This site was discovered in 1987 and has been a popular tourist destination since then. Dos Ojos has one of the deepest known cave passages that runs 118 meters deep. This cave system has crystal clear water and visitors can see various shades of blue and green. Activities at Dos Ojos include cave diving, snorkelling, scuba-diving, and visiting a bat cave. There are also bathrooms and restaurant on site along with changing rooms. Also, visit the popular attractions in the city by following Cancun itinerary 3 days. Kindly read and follow all the safety instructions carefully. 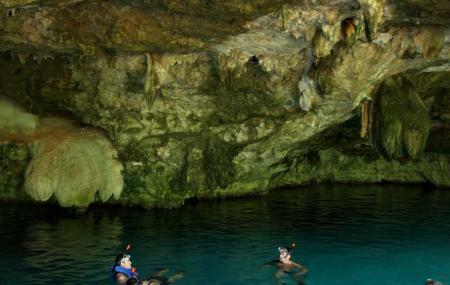 The mentioned ticket price includes Transportation from Dive Shop to Cenote, Entrance Fees, Lights and Drinks. Kindly refer to their website for more packages and discounts. Your timings to visit shall depend on the tour operator to which you will be tied to. How popular is Sistema Dos Ojos? People normally club together Akumal Beach and El Parque De Las Palapas while planning their visit to Sistema Dos Ojos. People also prefer to start their day with Sistema Dos Ojos. Great experience of cenotes in the town. The place was surrounded with many other cenotes which we couldn’t cover due to lack of time but this one “Dos Ojos”(2 eyes) was worth visiting. Options to do snorkeling and swimming in a sacred sparkling clean aqua water which will give a mesmerising feeling. One can visit the place for its tranquility and meditating serene nature with options of water sports and picnic with family and friends. Stunning cenotes in which you can admire the cave structure simply by snorkeling and even without a guide. The complex is huge and it is preferable to have a car or be willing to bike from one location to the other. You must pay for each cenotes individually. About 350 pesos for Dos Ojos. About 550 pesos for a guided snorkel tour through the biggest structure. This is a complex of Cenotes where you get to pick your package from one to a couple. The price will depend on your choice of cenotes. This time I went to "El Misterio Maya" supposedly opened for only two years. Guides are kind and friendly; although, they will make any excuse to do not let you get your camera in order to take you photos and sale them to you after. $20 for 20 pics. This complex has an entraces closed to the highway and depending on which one you picked you have to drive until the cenote of your choice. Misterio Maya is an amazing natural place. The package for this cenote includes mask, snorkel, and neoprene suit. It is worthy to visit.